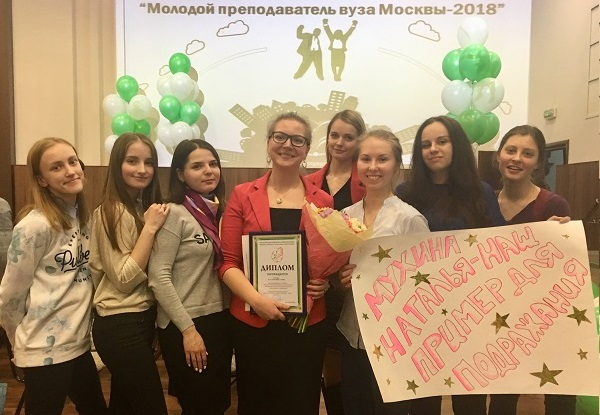 Natalia Mukhina, alumna of FLTA 2014-15 program, designed the course "American Studies" for 2nd year students of Moscow City Teachers' Training University. In preparing the course she mostly relied on the experience she got while at Colorado State University where she took “Ethnicity, Class and Gender” taught by Dr. Caridad Souza and “African-American Intellectual Thought” taught by Dr. Ray Black, as part of her curriculum obligation. Irina tried to make the course as authentic as possible and, as a result, her elective ended up as top favorite with more than 65 students signing up for it. "I tried to combine the information that I learnt and present it in the form that would be accessible to our students - as the course was taught in English and I had to keep in mind that English is their second language. The most exciting thing about the course was that students started thinking, analyzing and looking into certain aspects of the discussed topics they had never heard of or seen before", Natalia shared with the Moscow Fulbright office. "I chose to speak about education, immigration, racism, Native Americans and feminism. We watched a lot of TED Talks (such as "The New American Dream", "Whitopia" and many others), and for the feminism classes we studied an article by a Russian journalist who's moved to the U.S. "Why Do Most Russian Women Hate Feminism?". During one of the classes on racial issues students watched and analyzed the documentary "Malcolm X". After each class I asked them to submit a short essay on what they'd learnt and what their thoughts were - and I realized that students were actually ready to learn so much more than they are usually offered! Not all of the students spoke English fluently, but all of them started contemplating topics we were discussing! One of the goals of the course was not only to discuss what's going on in the U.S. but to bring this thinking into Russian reality. And I can say that there were some really outstanding students, open-minded and witty, and they were so advanced in the discussed topics that not only did they learn from me, but I got to learn from them as well! At the end of the course I asked them to evaluate the course and their level of engagement and give me written feedback. I received lots of very well-thought-out answers, some of the students got really inspired, some finally got a chance to be heard and feel support, some wanted to know more. There were, of course, those who openly resented it - but I take it as another sign of success, which means that they got really involved! We had heated debates during some of our classes and in general I feel like the vast majority of students were inspired and motivated. Maybe next year we can come up with some cross-cultural project "Russia - U.S." discussing common issues like race or feminism in two countries, via Skype or by exchanging e-mails and video recordings to accommodate the time zone difference."